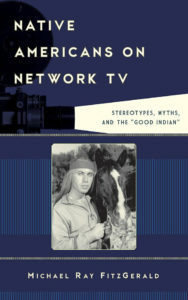 ow in 200 libraries all over world, Native Americans on Network TV: Stereotypes, Myths, and the “Good Indian” is the only work of its kind, an exhaustive study of American Indian characters on US television from The Lone Ranger to Longmire. After cataloguing nearly every recurring character from Tonto to Jacob Night Horse, FitzGerald noticed a persistent pattern: the most successful (i.e., long-running) characters, such as Tonto, Cochise (Broken Arrow), Sam Buckhart (Law of the Plainsman), Mingo (Daniel Boone), and Cordell Walker (Walker: Texas Ranger) have been those who helped enforce Euro-American norms. In other words, they are mostly literary descendants of Defoe’s character Friday, who assisted Robinson Crusoe. Ultimately, FitzGerald demonstrates how many Eurocentric, colonial tropes of the 18th and 19th centuries refuse to die. Available from Rowman & Littlefield. Many baby boomers grew up watching the Lone Ranger and his sidekick, Tonto. Portraying what media scholar Michael Ray FitzGerald refers to as the “good Indian,” Tonto often acquiesced to his white friend. The good Indian, the author writes in the introduction, “helped the white man in his quest to dominate the land.” FitzGerald observes that the US view of Native Americans has been molded by television portrayals of the good Indian, and he supports his argument with evidence from television portrayals of Native Americans in The Lone Ranger, Broken Arrow, Law of the Plainsman, Hawk, Nakia, and Walker, Texas Ranger. He applies George Gerbner’s cultivation theory to examine the good Indian in political, cultural, and historical contexts. Contending that American Westerns offer the bulk of television portrayals of Native Americans, FitzGerald examines how Native Americans have been (mis)represented, transformed, and distorted to fit the dominant political elements in US society at any given time. FitzGerald also includes positive stereotypes–for example, Iron Eyes Cody’s portrayal of “the crying Indian,” first used in a public service announcement on Earth Day in 1971. This excellent book is well suited for students in media studies and cultural studies. Summing Up: Recommended. Lower- and upper-division undergraduates; general readers. In recent years, scholars have shown increasing attention to television representations of race and ethnicity…. African Americans on television have been discussed at length in important works of cultural studies…. Substantially less attention has been paid, however, to television representations of other marginalized groups, particularly Native Americans. While there is a multitude of works exploring Native Americans in film and literature, there is a dearth of scholarship about televised representations. Michael Ray Fitzgerald’s Native Americans on Network TV is thus a welcome addition to the fields of both Native American studies and television studies. Building upon a diverse array of scholarship from ethnic, media, and cultural studies, Fitzgerald provides interesting insights into some well-known television Indians (most notably Tonto on the Lone Ranger), and perhaps more importantly, he calls attention to a number of Native American characters that have previously been forgotten or overlooked…. Fitzgerald’s primary argument is that, in contrast to Hollywood film’s frequent portrayal of natives as “bloodthirsty savages,” American television–in response to the Civil Rights movement and Cold War interests—has tended to represent Natives as “good Indians” who accept their marginalized position. More specifically, Fitzgerald argues that the most common television Indian is that of the Regulator or “native enforcer of the dominant group’s norms”…. Fitzgerald devotes the bulk of his study to Native American characters who, in some way, work in or with law enforcement. It should be noted then that Fitzgerald’s work is not a complete history of every recurring Native American character on network television but is rather a survey of a dominant trend over approximately fifty years…. Fitzgerald pays particular attention to mise-en-scene, looking closely at the ways in which characters are framed and shot as well as providing extended analysis of opening sequences. Throughout, he also relates each series to events happening at the time when the show aired, focusing most often on the Civil Rights movement and the Cold War. Fitzgerald’s analysis is enlightening throughout, as he demonstrates the ways that a harmful ethnic stereotype can survive and adapt over 50 years. Fitzgerald also does an admirable job of explaining how this stereotype serves to simultaneously reinforce a white supremacist ideology and act as a balm for America’s guilty conscience about the “winning” of the West. In the book’s final chapter, Fitzgerald provides an overview of the book and remarks upon the significance of his project for our larger understanding of American history and historiography. In particular, he asserts that the television shows under discussion work as a form of colonialist discourse, which feeds upon (mostly white) viewers’ narcissism and xenophobia…. Native Americans on Network TV provides many rich discussions of a neglected aspect of American television. The book will prove useful to students and scholars working in media studies, ethnic studies, or television history. Fitzgerald’s clear prose and careful explanation of key theoretical concepts also makes this study accessible to students.